When you have logged into the game you are presented with the Lobby. It is split into two panes, left and right. Someone wants to play with you! You can do moves in this game! The first time you log in this list will be empty, naturally. To fill it up you will have to start challenging other players (or wait until someone challenge you). This is what the right side of the lobby is for. Depending on what tab you have selected this list can either show a list of the top players of clairvoyance ("top"), or a list of recommended and saved foes ("foes"). "Recommended foes" are selected based on their likelyhood to be good and interesting opponents. "Saved foes" are players that you have decided that you want to have easy access to. To find a certain player that you know the name of, just use the search function. Enter the username (or a part of it) and press enter. The most important thing here is the level selection. Press the left and right arrows to cycle through the different levels. 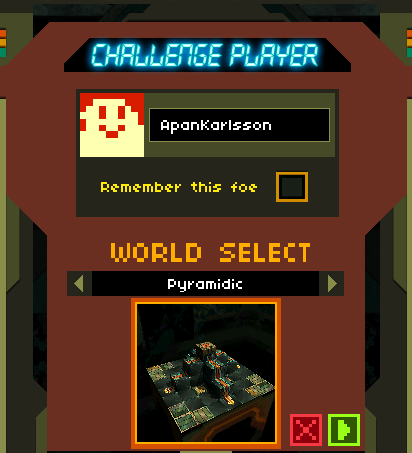 Press the green play button to begin the game and send an invite to the other player. This will bring you into the game, into the "place robots" screen. You can read more about that in the gameplay section.